I always pretend to be on a diet but as most women know, it is basically lying. (I am eating almond M&Ms as I write this post.) 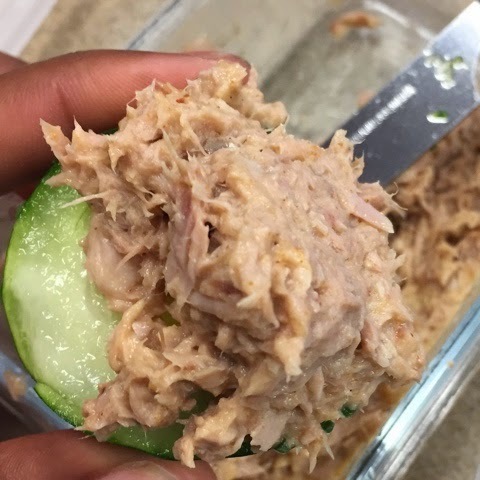 For lunch the other day, I had a real craving for tuna salad but I did not want to make it with avocado because I have had too much avocado this week - on toast, in everything... I had some ingredients in the kitchen and whipped this up to snack on later in the day and it was awesome! It was spicy and yummy and exactly what I wanted in the afternoon. Here is the recipe! 1. Open the can of tuna and drain all of the extra liquid out. 2. Add the mayo to the tuna and start mixing. 3. As you mix, add a dash of chili powder, a dash of cayenne pepper and a nice pinch of salt.